You are at:Home»Food»Cream of the crop in the historical centre of Naples! Do you want to taste the best food in the world? Do you want to taste it in just three hours? Do you think that it’s not possible? You’re wrong , but it’s possible only in Naples! The first thing that you must do is to come to Naples, the second one is to visit the historical centre of the city! Here you can find the best of Neapolitan food! Start from the pizzeria “Di Matteo” in via Tribunali. Here you have to taste two things: “ il crocchè” and “ la pasta cresciuta”. The crocchè is a potato roll, fried and stuffed with mozzarella, pepper and nutmeg while the pasta cresciuta (we call it also zeppola in Neapolitan dialect) is a fried salty dough. Both of these can be eaten as appetizers and are perfect while drinking a cold beer. 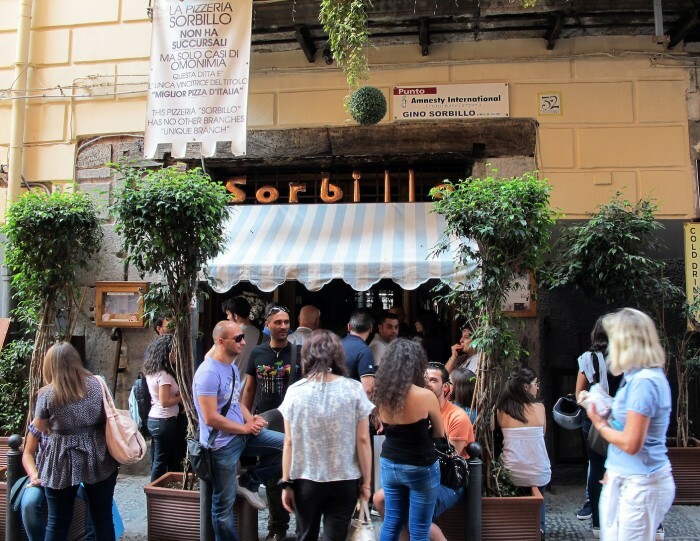 After continuing to walk along “via Tribunali”, you find the pizzeria ” Sorbillo”, where you must absolutely eat the wonderful pizza with eggplants, mozzarella and tomato. Going down Via S. Gregorio Armeno, the cribs’ street, you arrive in Via S. Biagio dei librai, keep on this street and you arrive in a small square, Piazzetta Nilo, where there are two places, very important for your tour. The first one is a small restaurant, Tandem, where you can play and eat in the same time. In fact here you can play at a very funny game: the waiters prepare many dishes with the famous Neapolitan meat sauce “Il ragù”, and also many glasses with our local wine, then you, in just a minute, have to eat as much Ragù with bread you can and also drink all the wine. At the end of the minute, you can decide, if you liked their food, to have dinner in the restaurant. The second one is a winery where you find many different types of wine, red and white, that you can try eating good olives and canapé and talking about your trip and your tour with the owner, a very nice man. Now it’s the moment of sweets, you know that in Naples we have many typical sweets, but the best, in my opinion, are ” Sfogliatella and Babà”. The best place where you can taste them is “Scaturchio”, very close to the winery. This pastry-shop is very old but even now, after so many years, the best one. After all the things you’ve eaten, and I assure you that you will feel full but satisfied, it’s time for a digestive. Back in Via Tribunali, and close to Napoli Sotteranea, there is a shop of Limoncello, a typical Neapolitan liqueur made by alcohol, sugar and lemons. The name of this shop is “Limonè” and you can try the liqueurs and buy many souvenirs for your relatives. The tour is over, and it should be added that it is also very cheap: you can do everything I’ve recommended with only thirty euros! Now you just need to come and eat “the cream of the crop” in the world!